Santa Cruz (The Holy Cross) commemorates Saint Helena of Constantinople, mother of Constantine the Great, making a pilgrimage to the Holy Land to find the original Holy Cross. In pre-Hispanic tradition, the date relates to the return of the rains and the indigenous’ belief that a cross’ four points representing the four seasons of the year, cycles of life and death, plus the masculine and feminine. May third is a special holiday for workers in the construction trades. 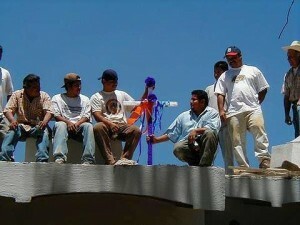 Workers return from morning mass bearing a priest-blessed cross and put it up on the highest point of the job site. Sky rockets are released to clear the area of dangerous spirits as food and dancing is enjoyed at the site. 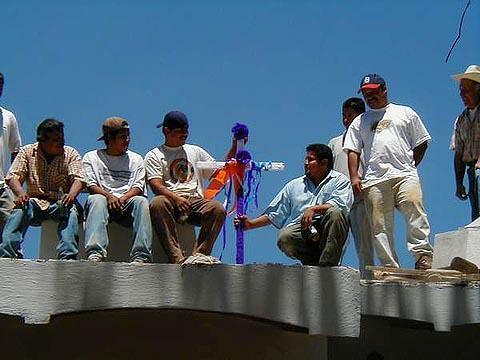 The midday meal supplied by the job site’s owner reflects the pre-Columbian custom of placing food and drink on specially constructed altars to dedicate new buildings, and to please the gods.